Crouton Queen: More green, please. So the other day I presented you with green cake. To balance things out, I'll share my first experience with a green smoothie. I was casually talking fruit smoothies with my cashier at Wegmans a few weeks back when she mentioned her daughter-in-law had gotten her hooked on green smoothies. I thought she was N.U.T.S. Not only that, but she said her daughter-in-law fed green smoothies to her 3-year-old! WHA?! I don't know about you, but when I was three, green was out. It still sort of is. You can't even taste the spinach. It just makes it green. Almost like food coloring. It was actually good. A real-life Green Eggs and Ham story. 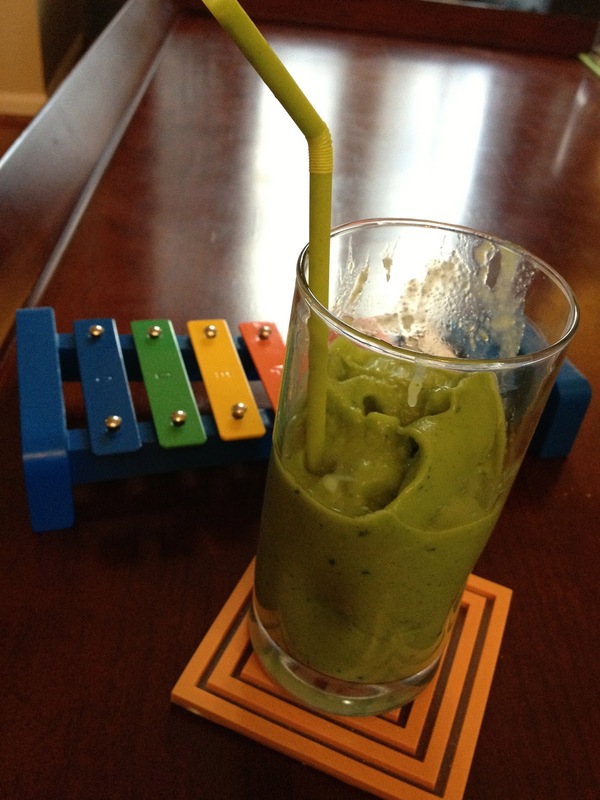 I would drink green smoothies in a house...hopefully not with a mouse. *Guess I'm still striving because that is only 3, but banana would be delicious and perhaps some OJ as the liquid? 1. Place ingredients in your choice of blending method. I prefer my immersion blender. 2. Mix and enjoy with a bendy straw. Always with a bendy straw. I went through a phase where I thought green smoothies were the thing to do but I'm past that and now can't even imagine going back. Glad you liked it though! It means you are free to eat tons of cheese for the rest of the day right?